Cross-country skiing and snowshoeing to Echo Lakes (and further into Desolation Wilderness via this route) is a favorite winter tour for Tahoe locals and visitors to the Lake Tahoe Basin. There is dedicated parking (unlike many Tahoe backcountry locations) at Echo Lake Sno-Park, the route is easy to navigate, and there is little elevation to negotiate. All this, and the views looking into Desolation Wilderness (and the glimpses of Lake Tahoe) are incredible! You can even see Freel Peak (highest peak in the Lake Tahoe Basin) once you begin to travel along the south side of Lower Echo Lake. Just remember to take a look back from where you came and you’ll see it framed in the distance. The only real drawback, and more than just an inconvenience but an actual life-threatening risk, is whether or not the ice and snow on Echo Lakes is stable enough to cross-country ski or snowshoe on. 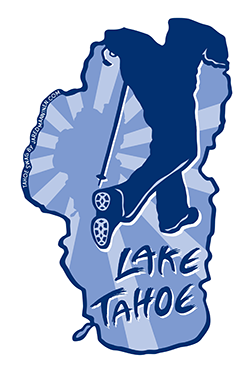 Check the snowpack levels around Lake Tahoe, as well as the weather history preceding your trip to Echo Lakes. If it’s a low-snow year in Tahoe and the temperatures have been consistently above freezing, I would not expect or plan to cross-country ski or snowshoe on the actual lakes. All is not lost, though, because you can still do the 2.5 miles round-trip trek from Echo Lake Sno-Park to Lower Echo Lake (keep reading). If, on the other hand, the temperatures have been cold enough and the snow level is deep enough around Lake Tahoe you’ll probably find plenty of tracks leading to (and beyond) Echo Lakes. As with any backcountry excursion, hope for the best but plan for the worst. Click on the above map to enlarge it for better viewing and printing. This map is only for reference and shows the general route for cross-country skiing at Echo Lakes (in Desolation Wilderness near Echo Summit). Your trip may look slightly different than mine based on your specific route selection. You don’t necessarily have to stay within the lines when traveling over snow! Always carry a traditional topographic map and compass when traveling in the backcountry. Park at the Echo Lake Sno-Park (Sno-Park permit required), which is located on Johnson Pass RD on Echo Summit. In the winter, Johnson Pass RD is only accessible from the west side of Echo Summit off of HWY 50. During bigger snow years or right after a significant snowstorm, Johnson Pass RD can be reduced to a single lane and be rutted out and bumpy from the excessive snow. If this is the case, you should have a vehicle equipped with all-wheel drive or 4-wheel drive and plenty of clearance. During the winter, the trailhead to Echo Lakes is directly across from the entrance of the Echo Lake Sno-Park. Just cross Johnson Pass RD and travel the road that leads to Echo Lakes. Here’s a map to help you to find the Echo Lake Sno-Park for parking to access Echo Lakes in Desolation Wilderness. Remember to pick up a Sno-Park permit in town because they are required and you can’t buy one at the Sno-Park. 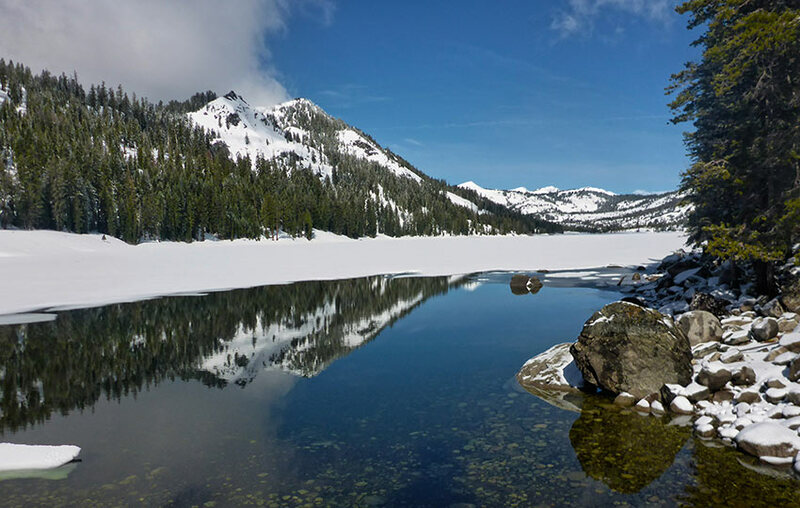 In the warmer months you could hike along the Pacific Crest Trail/Tahoe Rim Trail to Echo Lakes, but during the winter just plan on taking the Echo Lakes RD. This road does not get plowed, so you’re tour will start as soon as you leave the Echo Lake Sno-Park. And, most likely, there will already be some obvious tracks leading in the direction of Echo Lakes. The distance from the Echo Lake Sno-Park to Lower Echo Lake is approximately 1.25 miles. Some people simply cross-country ski or snowshoe to the Echo Chalet (located near the outflow of Lower Echo Lake), enjoy a snack, and then travel back to their vehicle. If that’s all you have time for, so be it. The trip is relatively short, but the view of Lower Echo Lake and the glimpses of Lake Tahoe through the trees is definitely worth it. If you’re looking for a longer day, continue to cross-country ski or snowshoe the length of Lower Echo Lake and back. Or, for an even longer adventure, continue all the way to the far side of Upper Echo Lake before making your return. The one-way distance to the end of Upper Echo Lake is approximately 3.5 miles from the Echo Lake Sno-Park. In spite of the fact that the Pacific Crest Trail/Tahoe Rim Trail skirts the northern edge of both Echo Lakes, do not travel the north side trail in the winter as it’s prone to avalanches. Also, the northern edge of both lakes gets baked by the sun during the warmest hours of the day making for unstable ice and snow. Instead, travel along the southern edge of both lakes. Significant portions of the route along the south side of the lakes remain in the shade during the warmest parts of the day, which helps to preserve the ice and snow. Call me paranoid, but I generally avoid traveling directly down the center of a “frozen” lake. I grew up in Minnesota and I know what a cold winter feels like and, in comparison, Tahoe just doesn’t get that cold. In fact, during the winter of 2017/18, the average daytime temperature at Lake Tahoe in January was 40+ degrees. When we actually had snow during that month, I was cross-country skiing in a t-shirt. Also, during the beginning of February 2018, half of Lower Echo Lake was still open water. The entire lake wasn’t fully covered until we received a massive snowfall (5+ feet in the higher elevations) during the first week of March 2018. Ultimately, between the generally warmer winter temperatures and the intensity of the sun due to the higher elevation of the Tahoe region, the snow and ice can undergo rapid transformations (i.e. melt really fast!) in a short amount of time. So, my recommendation is to hug the southern edge of Echo Lakes and resist the urge to go into the middle of either of them. If in doubt, turn back or get off of the lake. There is no photo or feeling worth risking your life for. As fun as it would be to cross-country ski or snowshoe loops around both lakes, I would plan to travel an out-and-back route along the southern side of the lakes (as indicated on the map/route below). I hope I was clear in the above description of that northern edge but, again, that side of the lake consistently gets baked and should be avoided. That is, unless Tahoe has been experiencing a severely cold and snowy winter. However, travel along the north side is at your own risk and peril. Please note that there are many privately owned cabins and structures located on Echo Summit and at both Echo Lakes. These structures (or previous versions of them) were in existence well before Desolation Wilderness was actually designated a “wilderness” area (and have been grandfathered into the system). You wouldn’t want strangers poking around your house while you were away on vacation so show the same respect for these private structures and leave them alone, whether they be on Echo Summit or at Echo Lakes. A short panoramic video I captured of Lower Echo Lake on March 5, 2018.